The raw LED lights can be hard to view. This is very similar to the cars with the blue colored white headlights, which is very unpleasant to view straight on. There is a simple fix, it is called a diffuser. 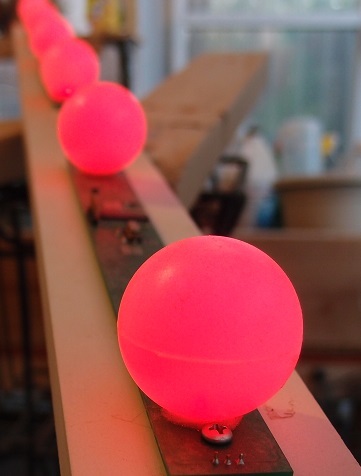 This can come in many forms, an florescent ceiling light panel, a plastic ping pong ball, PEX water tubing, or buying the lights with existing diffusers. When getting started, it is easier to buy your lights with existing diffusers. The plastic ping pong balls look very nice, and they can be bought online for $10-$12 for a gross. The Coroplast panel is often used since it is readily available at home improvement stores, but I dislike the lines in the panel. However, if you move the light further from the panel there are interesting effects. The last picture shown is a flourescent light diffuser.